Facebook everyone knows about it every day people use it more than a Half-an-hour with uploading are chatting with Friends now coming to the point we all play Games on Facebook by opening it on computer but know Facebook is rolling out a new feature "Instant Games" which is testing at Facebook this was Native Mobile Ecosystem established by the help of Google and Apple by their mobile Operating System which is based on "HTML 5" game platform. A report according to the Facebook "Facebook Messenger" it has inbuilt games like basketball and some them are available to play without precise data to launch for this new platform. Instant Games is currently available in 30 Countries it supports IOS (V8) or later and Android (V5) or later. 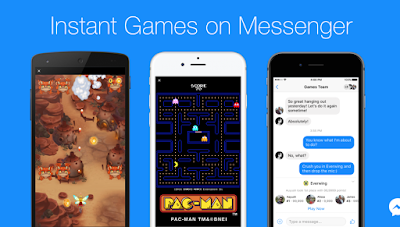 In Instant Games 17 Games are available and more to be expected in Messenger and Newsfeed of latest updated version. This Instant Games not Officially announced yet.